Barry, Bridget R., "Toxic Tourism: Promoting the Berkeley Pit and Industrial Heritage in Butte, Montana" (2012). Cameron, D., Willett, M., & Hammer, L. (2006). 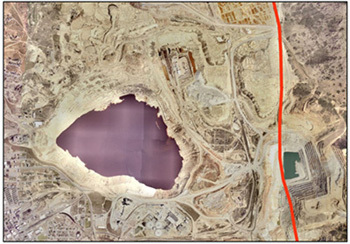 Distribution of organic carbon in the Berkeley pit lake, Butte, Montana. Mine Water and the Environment, 25(2), 93-99. Duaime, T.E. Tucci, N. J, 2009, Butte Mine Flooding Operable Mine Unit Water-Level Monitoring and Water Quality Sampling 2008 Consent Decree Update Butte, Montana 1982-2008 (CD only), Montana Bureau of Mines and Geology: Open-File Report 589, 157 p.
Gammons, C. H. (2006). Geochemistry of perched water in an abandoned underground mine, Butte, Montana. Mine Water and the Environment, 25(2), 114-123. Gammons, C. H., & Duaime, T. E. (2006). Long term changes in the limnology and geochemistry of the Berkeley pit lake, Butte, Montana. Mine Water and the Environment, 25(2), 76-85. Gammons, C. H., & Madison, J. P. (2006). Contaminated Alluvial Ground Water in the Butte Summit Valley. Mine Water and the Environment, 25(2), 124-129. Gammons, C. H., Metesh, J. J., & Duaime, T. E. (2006). An overview of the mining history and geology of Butte, Montana. Mine Water and the Environment, 25(2), 70-75. Gammons, C. H., Metesh, J. J., & Snyder, D. M. (2006). A survey of the geochemistry of flooded mine shaft water in Butte, Montana. Mine Water and the Environment, 25(2), 100-107. Gammons, C. H., Poulson, S. R., Metesh, J. J., Duaime, T. E., & Henne, A. R. (2003). Geochemistry and isotopic composition of H2S-rich water in flooded underground mine workings, Butte, Montana, USA. Mine Water and the Environment, 22(3), 141-148. Gammons, C. H., Wood, S. A., Jonas, J. P., & Madison, J. P. (2003). Geochemistry of the rare-earth elements and uranium in the acidic Berkeley Pit lake, Butte, Montana. Chemical Geology, 198(3), 269-288. Metesh, J. J. (2006). Using a water balance to determine the source of water in the flooding underground mine workings of Butte. Mine Water and the Environment, 25(2), 108-113. Newbrough, P., & Gammons, C. (2002). An experimental study of water–rock interaction and acid rock drainage in the Butte mining district, Montana. Environmental Geology, 41(6), 705-719. Pellicori, D. A., Gammons, C. H., & Poulson, S. R. (2005). Geochemistry and stable isotope composition of the Berkeley pit lake and surrounding mine waters, Butte, Montana. Applied Geochemistry, 20(11), 2116-2137. Stierle, A. A., & Stierle, D. B. (2005). Bioprospecting in the Berkeley pit: bio active metabolites from acid mine waste extremophiles. Studies in Natural Products Chemistry, 32, 1123-1175. Stierle, A. A., Stierle, D. B., & Kelly, K. (2006). Berkelic acid, a novel spiroketal with selective anticancer activity from an acid mine waste fungal extremophile. The Journal of organic chemistry, 71(14), 5357-5360. Stierle, D. B., Stierle, A. A., & Patacini, B. (2007). The berkeleyacetals, three meroterpenes from a deep water acid mine waste Penicillium. Journal of natural products, 70(11), 1820-1823. Stierle, D. B., Stierle, A. A., Hobbs, J. D., Stokken, J., & Clardy, J. (2004). Berkeleydione and berkeleytrione, new bioactive metabolites from an acid mine organism. Organic Letters, 6(6), 1049-1052. Twidwell, L. G., Gammons, C. H., Young, C. A., & Berg, R. B. (2006). Summary of deepwater sediment/pore water characterization for the metal-laden Berkeley pit lake in Butte, Montana. Mine Water and the Environment,25(2), 86-92.